I can get lost in pebbles! They are fun to stitch but very time consuming! I usually put on a good audio book and keep stitching until I can’t stand it or until my shoulders ache – then I take a break and do something else! I’ve been having a blast playing around with different weights and colors of Aurifil threads as I quilt my myriad of projects. My go-to thread is the standard 50 weight cotton which blends wonderfully with any fabrics. 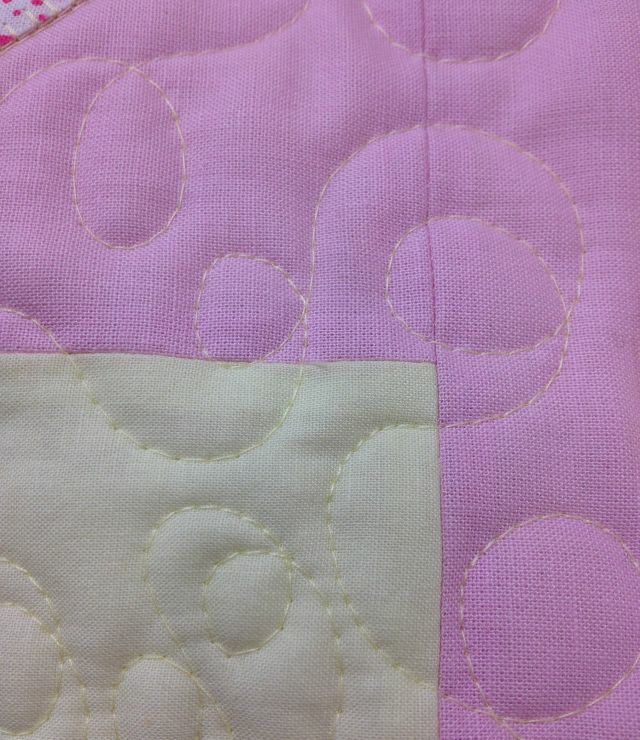 I’m also experimenting with quilting spirals – in a slightly heavier thread – I love it! However, I have been getting a little more daring. I usually try to match my thread colors to my fabrics but have been playing with variegated thread colors and heavier weights, too. I’m really liking the 40 weight Aurifil cotton which is just a tad heavier than the 50 weight (the smaller the number – the heavier the thread). 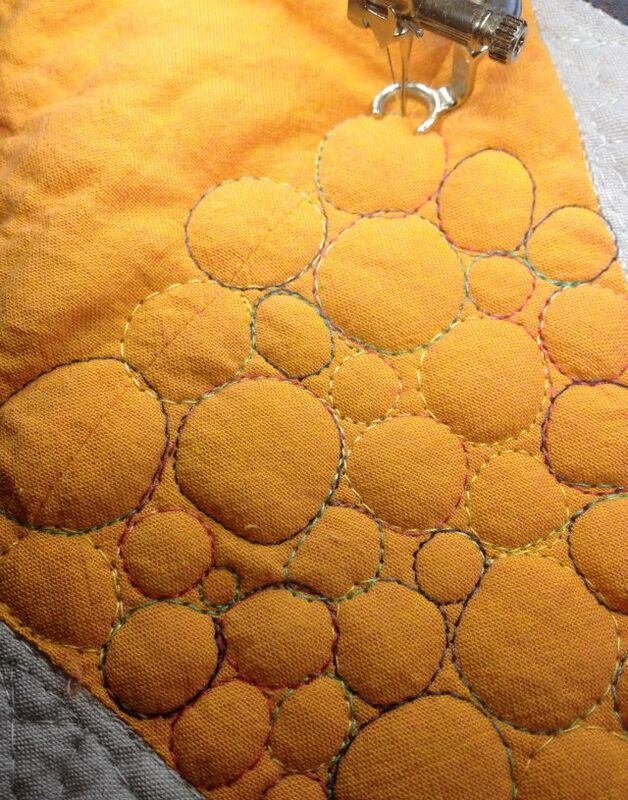 I even tried some of the heavier 28 weight which adds a nice definition to the quilting. I love the Aurifil cottons because they go through my machine with ease and they don’t break! I usually use a size 80 needle with the size 50 thread and then switch to a heaver size 90 needle when dealing with the thicker threads. So far, so good. Loops are a great go-to design anytime. They always look good on any pattern! I usually stick with the regular 50 weight thread in the bobbin in a similar color so that I can pack a lot of thread onto one bobbin for more non-stop quilting. Swirls always take my breath away. They don’t have to be perfect, either, to look good! 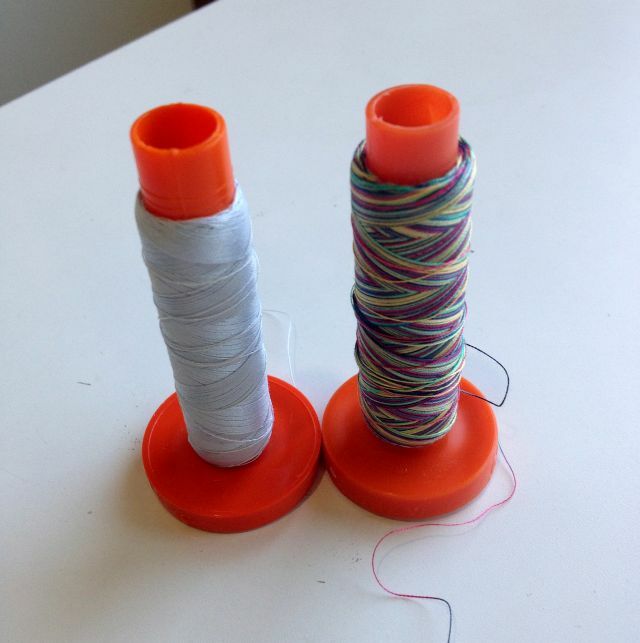 Nearly empty spools of thread make me happy! i want to try a NICE spiral… means i have to be more patient. ha! This is such a good post! 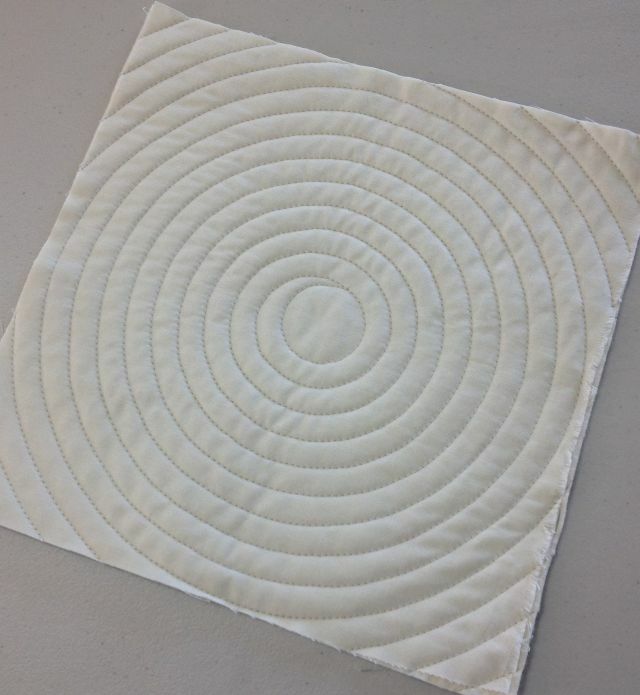 It’s nice for newer quilters to pick up more tips for FMQing. Learning about thread weights and needle sizes is invaluable information. You do beautiful work, especially on the big spiral. I understand that The Stencil Company makes a large template for it, though I don’t know how often I might put it to use. Keep up your beautiful, award-winning work! Love your show and tell! I’m working on a double wedding right quilt using the QIAD method. But I finished the Jacquie Gering class you recommended on the APQ podcast-totally worth it and am eyeing up which of my upcoming projects I could try spirals on. I did my last quilt with wavy lines (the M*QC mystery quilt) and am in complete love with how that came out. So thanks for the recommendation! I just finished a baby quilt. I used a rayon thread. It gave a nice sheen. My next project is a basket weave pattern quilt. 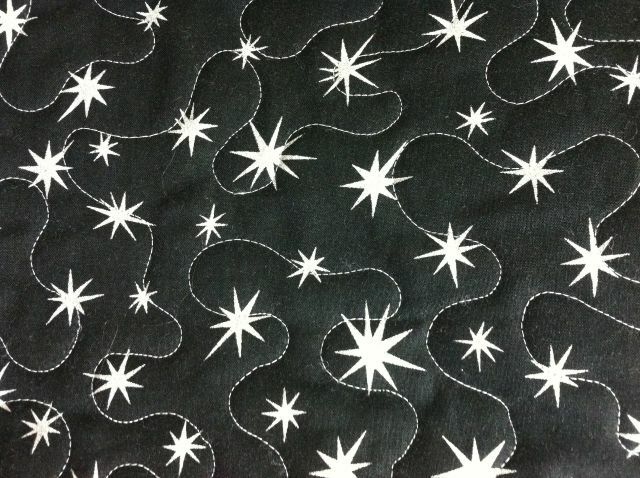 How would you recommend quilting it? Yup totally agree with Christine Sherman. These are so pretty. I love the variegated thread. I am still working on my sons wedding quilt. Whew, a lot of work on this. I will persevere. I love those pebbles in the variegated thread! 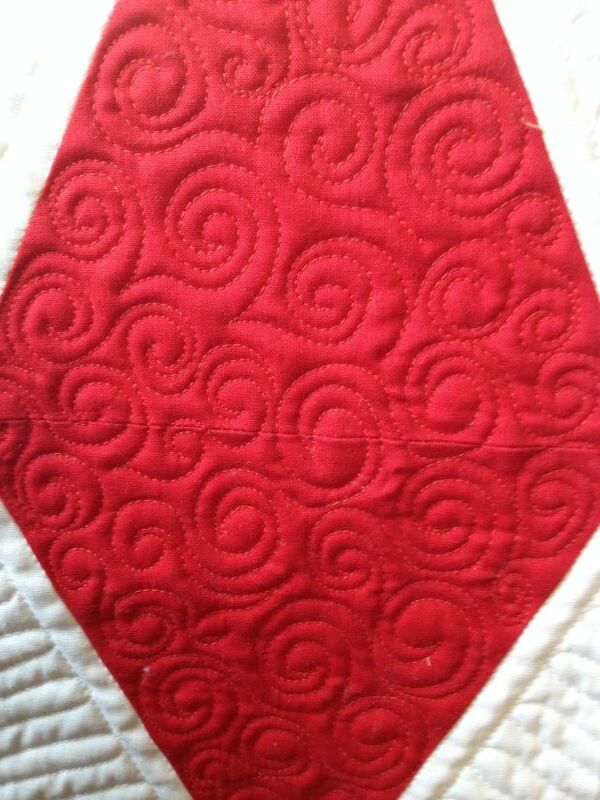 Swirls are my favorite, they are fun to quilt, forgiving and pretty! For the project I am working on I did not have the exactly the color I wanted but by threading the machine with a 50wt cotton and an embroidery thread for machine embroidery I got a perfect color. The stitching looks textured . Love experimenting with new ideas. and I would not have the courage to do it without your inspiration . Keep it up. How fun and way to experiment!! Thanks Mary! I use a Bernina 710 with the wider throat space (harp space). I don’t use a stitch regulator. It was an optional add-on but I didn’t purchase it. Very cool! LOVE the swirls. I have only been sewing for about 2 years and since I have transitioned more into quilting I have learned that quilters sure are serious about thread! haha…and everyone has a different opinion! So, to solve that dilemma, I am trying out every brand of thread I can get my hands on 🙂 Thanks for the info. I have a cone of Aurifil just waiting for me to try. I think that is very smart of you! I did the same thing – tried out every brand of thread I could think of until I settled on something I liked. Good luck and happy experimenting! Oh Christa, your pebbles are so nice and round. Mine always look like real pebbles… Oval and a bit kidney shaped. I wish I couldd o big round pebbles too. I did not know you could FMQ with 28 weight Aurifil. I will have to try that!!! Hi christa, I love the big spiral, looks fab. Did you draw the line first? I had to laugh at the nearly empty spools. I’ve only been quilting for about a year and a half. For some reason when I finally emptied my very first spool of Aurifil 50 wt it made me so happy. Weird, huh? I think this is something only another quilter would understand. Thanks for the thread show and tell! It is nice to SEE the effect that the different thread weights have.